The New York Islanders have lost some depth as forward Tanner Fritz is expected to miss six to eight weeks after undergoing surgery to repair a blood clot in his hand, according to NHL.com’s Cory Wright. While the 27-year-old Fritz has only appeared in eight games for the Islanders this season, he was recalled on March 21st after veteran Valtteri Filppula was injured, giving Fritz the opportunity to play in the team’s last three games. Fritz was averaging only 10:49 of ice time with the Isles, but has been solid with the Bridgeport Sound Tigers of the AHL where he has 12 goals and 37 points in 57 games. As for Filppula, head coach Barry Trotz said that he has been skating, but there is still no timetable for his return. Expect Ottawa Senators interim coach Marc Crawford to be a serious candidate for the team’s head coaching position, according to Ottawa Sun’s Bruce Garrioch. While general manager Pierre Dorion has a list of many candidates, the team won’t allow their search for a president of hockey operations to interfere with their hunt for a head coach. Crawford deserves consideration for that position as he has made a difference on the Senators’ young squad. Belleville head coach Troy Mann is another serious candidate for the Senators’ coaching vacancy. Garrioch reports that Dorion and goaltending coach Pierre Groulx watched Arizona State goaltender Joey Daccord Saturday and are expected to try to sign the collegiate goaltender. Daccord had a breakout year with Arizona State as the junior put up 21 wins, a 2.36 GAA and a .926 save percentage. He was the team’s seventh-round pick in the 2015 draft. TVA’s Renaud Lavoie reports that Montreal Canadiens forward Paul Byron, who has missed two games with an upper-body injury, was back on the ice Sunday, but still needs to pass some tests before he is cleared to play. The 29-year-old Byron has 15 goals and 30 points in 54 games and could be available to play for Montreal on Tuesday if all goes well. The Lehigh Valley Phantoms, the AHL affiliate of the Philadelphia Flyers, announced that prospect Matthew Strome has been reassigned from his OHL team, whose season recently ended. Strome, the team’s fourth-round pick in the 2017 draft, just wrapped up his fourth year with the Hamilton Bulldogs, posting 28 goals and 79 points. He signed his entry-level contract in March of 2018 and will finish out the season with the Phantoms. The New York Islanders will be heading into the playoffs without one of their veteran leaders, as head coach Barry Trotz told reporters including Andrew Gross of Newsday that Andrew Ladd will be out four to five months with a torn ACL. That rules him out for the playoffs, though the team is hoping he’ll be ready for training camp next season. That hope though may be tested, as Ladd is no longer a young pup able to rebound quickly from injury. Now 33, the former Winnipeg Jets captain has already experienced a knee injury in his other leg and will finish this season with just 26 games played. The veteran forward was once one of the most reliable two-way wingers in the game, bringing a mix of physicality, defense and scoring touch to the ice on a nightly basis. Now, he will end with his lowest point total since his rookie season of 2005-06 and could very well start next year on long-term injured reserve. Unfortunately for the Islanders, Ladd still has four years left on his current contract and unless he’s going to sit on LTIR and essentially retire, he has to find some modicum of health in order to contribute. The team signed him to a seven-year, $38.5MM deal in the summer of 2016 that included a full no-trade clause through the end of 2019-20. Even after that he’ll still have a 15-team no-trade list, and his contract is almost buyout proof because of the hefty signing bonuses. The Islanders will try to make a splash this postseason without him, and it appears as though Michael Dal Colle will get the first chance to replace him in the lineup. The former top prospect has seemingly put it all together this year and become a legitimate NHL player, but will have to show he has what it takes to compete in the playoffs. With the New York Islanders sitting in second place in the Metropolitan Division and the Florida Panthers not yet out of postseason contention, eight points back of the final wild card slot with a game in hand, fans are not yet looking toward next season with plenty of meaningful games left this season. Yet, the two Eastern Conference teams are expected by many to be some of the most active players in the upcoming off-season. The Islanders could have more cap space entering the summer than just about any other team, while the Panthers have not won a playoff series since 1996 and are desperate to take a step forward. Both teams have needs and could look to fill them in explosive fashion this off-season. Things have gone as well as they possibly could have this season for the Islanders. Despite losing John Tavares and entering the year with an unproven goalie tandem, the team is not only playoff-bound, but also the league leader in goals against average. Robin Lehner and Thomas Greiss have been stellar in net, the team’s young defensemen have taken a major step forward under new head coach Barry Trotz, and the offense has picked up the seemingly insurmountable slack that Tavares left behind. Yet, much of their success could be undone by free agency, which would leave the team in need of making several big additions. Lehner is an impending free agent and the Isles must decide whether or not to commit to the young reclamation project or else seek a long-term replacement, with 33-year-old Greiss only signed for one more year. Yet, the net is not even the greatest of their concerns. Captain Anders Lee and fellow top forwards Brock Nelson and Jordan Eberle are approaching free agency without new contracts. After losing Tavares last summer, it seems almost impossible that New York could also let Lee slip away. But can the same be said for Nelson and Eberle, who are also top-five scoring forwards for the Isles. The team may be in a position where they need to add considerable talent up front, as well as replenish depth. Currently projected to have the fourth-most cap space of any team this summer, the Islanders could hypothetically re-sign Lehner and their trio of forwards without issue or else find free agents on the market. However, if spending power is not enough to bring in top free agents – like say Artemi Panarin and Sergei Bobrovsky – GM Lou Lamoriello could explore the trade market. The Athletic’s Arthur Staple writes that the Islanders’ newfound depth on the blue line could help to facilitate a major trade. He believes that the team wants to move forward with a young core of Ryan Pulock, Adam Pelech, Scott Mayfield, and Devon Toews on the blue line. He also mentions AHL All-Star Sebastian Aho as another key piece, while recent high draft picks Noah Dobson and Bode Wilde also deserve consideration. This youth movement has made top defenseman Nick Leddy expendable and Staple believes that he is a talent that could bring back an established top-six forward. The Islanders could also look to move veterans Johnny Boychuk and Thomas Hickey instead of or in addition to Leddy. That trade flexibility paired with ample cap space make the Isles a dangerous player on the trade market this summer, if not all of their problems can be fixed via free agency. In fact, the Panthers could wind up being an ideal trade partner for the Islanders. Florida leads the NHL this season with five 20-goal scorers and has an offensive game and potent power play that few in the league can rival. However, their defense and their goaltending both leave a lot to be desired. The Panthers don’t have the cap space that the Islanders do, but The Athletic’s George Richards believes that the team plans to make trades to free up cap space in order to hit the free agent market with more bargaining power. Florida is another team that has been linked to the Panarin/Bobrovksy package, while they are also a team that could greatly benefit from adding Erik Karlsson. Richards writes that the team will be “aggressive” in pursuing top free agents, but that doesn’t mean they will succeed in drawing targets to a non-traditional hockey market. As such, Florida could also wind up making noise on the trade market and a name like Leddy would be the caliber of player they would like to add. Mike Hoffman and Evgenii Dadonov have enjoyed strong seasons with the Panthers this year, but both have just one season remaining and could be on the trade block this summer. There were also rumors that Jonathan Huberdeau was a player that GM Dale Tallon listened to offers for at the trade deadline again and he could do so again for the team’s highest-paid forward. These are names that will move the needle for other NHL clubs. Veteran goaltenders Roberto Luongo and James Reimer? Not so much. However, the team needs to improve on its poor goaltending and to do so would need to move one (or both) of the tandem costing them a combined $7.933MM. This may involve Florida moving picks or prospects as well. There are many layers to the trade possibilities for the Panthers this off-season, making them a fascinating team to watch. With weeks remaining in the regular season and the unknown of the postseason yet to come, the status quo could change for either one of these teams. As things stand though, there are major question marks for both squads that at this point don’t look like they can be answered until after the playoffs have ended. As soon as that happens, the Islanders and Panthers will become must-watch teams in how they approach the NHL Draft, the start of free agency, and the summer trade market. Both clubs could look drastically different in 2019-20 by way of an active off-season. The Columbus Blue Jackets may be getting another big prospect into the organization sooner than later as The Athletic’s Tom Reed reports that goaltending prospect Elvis Merzlikins will likely soon sign an entry-level deal now that his Swiss League team has been eliminated. The 24-year-old prospect could find himself battling for Columbus’ starting goaltending job next season. Expect that in the next few days, the Blue Jackets sign Merzlikins, who has been the starting goaltender for Lugano for the last six years, get his immigration papers in order and get him to Cleveland of the AHL to get into as much action as possible before the end of the season. The 24-year-old had an impressive season in the Swiss League with a .921 save percentage and a 2.44 GAA in 43 games this season. A third-round pick in 2014, Merzlikins has opted to stay overseas since drafted, but suggested last summer that he might come over this season. With Sergei Bobrovsky likely headed elsewhere in free agency this summer, the team could give Merzlikins a shot at the starting job. Philadelphia Flyers forward Claude Giroux may miss his first game in more than three years as interim head coach Scott Gordon said that Giroux is ill and will be a game-time decision Sunday, according to Philly.com’s Sam Carchidi. The 31-year-old has played in 256 straight games, dating back to February of 2016. If he can’t play, Justin Bailey will replace Giroux who has 20 goals and 76 points this season for Philadelphia. The New Jersey Devils are without forward Miles Wood once again Sunday as he will continue to sit out with a right ankle fracture despite making the West Coast trip with the team, according to Chris Ryan of NJ.com. Wood, who has been out since Feb. 25, remains day-to-day. The 23-year-old hasn’t been as effective for New Jersey after a breakout 19-goal season a year ago as he has eight goals and 21 points in 56 games this season. Sportsnet’s Nick Kypreos stated on Hockey Night in Canada late last night that Toronto Maple Leafs assistant coach D.J. Smith could draw quite a bit of interest as a head coaching candidate this offseason. Smith was considered a top candidate for the New York Islanders job before Barry Trotz came available and took the position. Smith may get quite a bit of interest from the Ottawa Senators this summer. Ottawa considered Smith back in 2016, but Toronto rejected their request to interview him. They hired Guy Boucher instead. 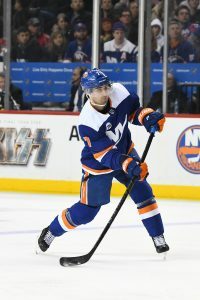 The New York Islanders could have gotten back defenseman Johnny Boychuk Saturday as the veteran defenseman was available to play, according to Newsday’s Andrew Gross. Boychuk appeared to hurt his shoulder when he took a hit from Philadelphia’s Jakub Voracek last week, but Islanders head coach Barry Trotz said that Boychuk could have played. However, with the defense having played so well against Montreal Thursday, Trotz elected to keep the same six on defense against Detroit. He could play Sunday, however. The team could also get back Casey Cizikas on Sunday as well. The Islanders named him a late scratch after he suffered a lower-body injury in warmups before Saturday’s game. The 28-year-old, who is having a career year, was suffering from a stomach flu several weeks ago and still hasn’t recovered from it. The Columbus Blue Jackets announced that captain Nick Foligno did not travel with the team to Boston for their game today against Boston for personal reasons, but add that the personal reason doesn’t have anything to do with his daughter’s recent surgery. Foligno, who has 16 goals and 30 points this season, is expected to be back in the lineup soon. Foligno has missed some time this year due to the health of his now-five year-old daughter, who had to undergo a procedure in December/January. The Blue Jackets next play on Tuesday in Calgary. The New Jersey Devils got some good news on the injury front as defenseman Mirco Mueller was recently released from the hospital after taking a scary hit Wednesday against Calgary, which required him to be stretchered off, according to NJ.com’s Chris Ryan. Mueller stated that the injury won’t keep him out long-term. Head coach John Hynes stated that Mueller didn’t suffer any significant head or neck injuries and Mueller would likely play again this season. Mueller has played a career-high 47 games this year, putting up a goal and 10 points. With Jakub Voracek already out, the Philadelphia Flyers lost another forward as Nolan Patrick was hit in the head with a shot and is unlikely to return to the game against the New York Islanders, according to Philly.com’s Sam Donnellon. Patrick has had a rough few days as he was boarded by New Jersey’s Kurtis Gabriel Friday, which cost Gabriel a one-game suspension. No word on how serious the injury is. The New York Islanders played without forward Matt Martin today, who is out with an upper-body injury. However, Newsday’s Andrew Gross reports that Islanders head coach Barry Trotz said that the injury isn’t long-term and that he was a real possibility to play today. Martin, a key bottom-six forward, has five goals and 13 points in 52 games this season. With the impressive play of New Jersey Devils goaltender MacKenzie Blackwood, the team might have an opportunity for him to compete for the Calder Trophy next season. Blackwood has appeared in 15 games for New Jersey, but with just 16 games remaining in the season for the Devils, The Athletic’s Corey Masisak writes that if Blackwood plays in 10 or fewer games, he’d be eligible for the Calder Trophy next year. After sending out a letter, telling fans that the team intends to rebuild last February, the New York Rangers rebuilding project is well underway, but The Athletic’s Shayna Goldman (subscription required) writes that there is one problem the team has — they aren’t losing enough. One key aspect of a rebuilding team is to pick up top prospects and the best way to do that is through the entry draft. However, with the team’s 21-20-7 record this season under new head coach David Quinn, their 49 points would give them the 22nd best record in the league, which would not give them a chance at super prospects Jack Hughes or Kappo Kakko next season. While there is never a guarantee to picking up a top pick due to the draft lottery, had the team just five points fewer, 44 points would have put them 30th. Of course, if New York trades off more players at the deadline such as Kevin Hayes or Chris Kreider, the team may continue to drop in the standings and improve their chances at a top pick. However, it could have a negative effect on the team’s environment that Quinn has developed this season. Andrew Gross of Newsday writes that despite the layoff, neither defenseman Thomas Hickey and winger Andrew Ladd of the New York Islanders have a timetable to return and remain on injured reserve. Hickey, who has been out with an upper-body injury since Dec. 17, could be out for some time as head coach Barry Trotz said the defenseman will need four or five practices before being able to play, which could mean he may not be back into the lineup until mid to late February. Ladd, who has been out with a lower-body injury and has been out since Nov. 15, and also may not be back until late February. NJ.com’s Chris Ryan analyzes the New Jersey Devils’ roster, looking at what players should stay and go and while even a few months ago, goaltender Keith Kinkaid was considered to be a key piece to the Devils’ success after proving last year that he can handle the full-time job well, it’s likely time to move on from the 29-year-old, who has struggled quite a bit of late. Kinkaid, who is in the final year of a two-year, $2.5MM deal he signed in 2017, has struggled this year with a 13-14-6 record, a 3.10 GAA and a .899 save percentage. Throw in the fact that MacKenzie Blackwood looks like the team’s long-term starter and the fact that the team can’t move Cory Schneider due to his lengthy and expensive contract and Kinkaid is likely to be looking for a new team this summer. The Athletic’s Charlie O’Connor (subscription required) answers mailbag questions, pointing out that the Philadelphia Flyers are likely to bring up more prospects over the next several months. The team will likely recall defenseman Philippe Myers at some point this season. O’Connor writes that Myers has been playing impressive hockey with the Lehigh Valley Phantoms of the AHL for the past two months and looks to be a player ready to take over a spot on Philadelphia’s defense next season. To ensure that, the Flyers will need to bring him up and give him some playing time this season.